Threads can be formed in blown glass with out expensive machinery and elaborate tooling. Its a simple techniqe that makes satisfying results and highly sellable artistic forms. It is important to note the threads on a glass bottle are not like pipe threads at all, but rather they are a special shape, to allow the glass to form in with out sharp edges and a special pitch. Making blown soap pumps is a unique way to brand, sell, and dispense your own homemade soaps, and liquid items, in an enviromentally friendly way when compared to disposable plastic packaging. 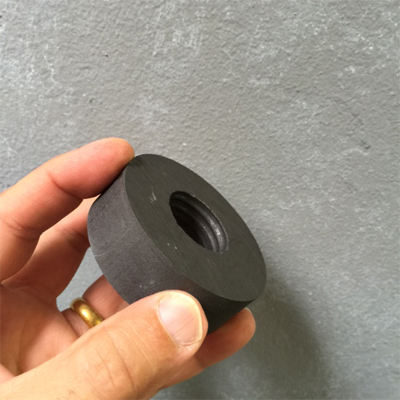 This is a special high temperature graphite thread mold for making threads in hot glass, the threads are rounded, and calculated to fit the... 'A'... size soap pumps available from One Dream Design. 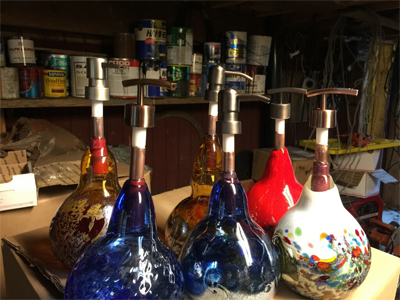 Threads are formed by dropping the mold over the neck of a bottle form on a punty (made smaller than the opening of the mold) of the hot glass, then using the jacks to open and press from the inside of the bottles opening out, pushing the hot glass into the molds threads. Its best not to allow the mold to spin as this will wipe out the threads. 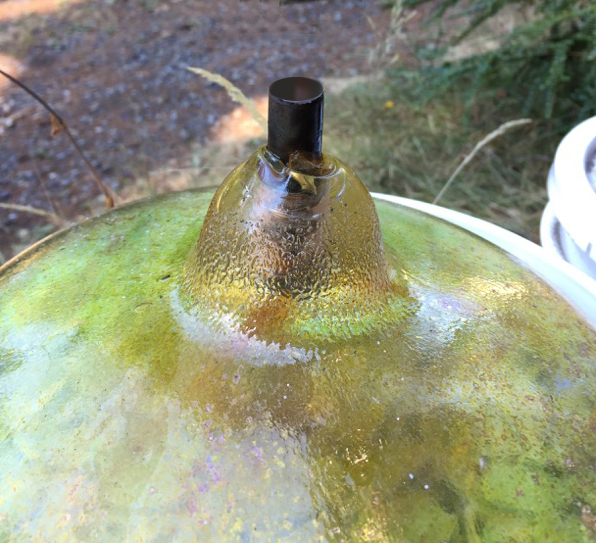 When the glass has cooled enough the mold may be unscrewed from the bottle. This is the most exacting method for gertting the threads on, and it takes a while to get the technique down. but when finished provides a fool proof leakproof fit. 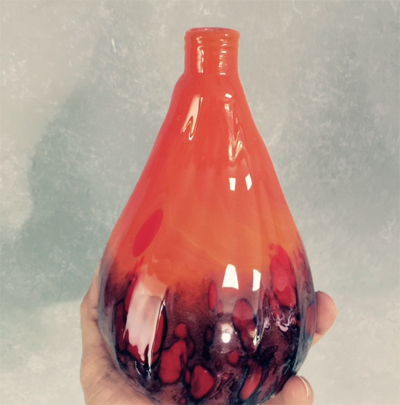 This glass blowing artist uses a 1/2 inch copper blowpipe and just cuts it off leaving it embedded in the neck of the soap pump bottle, avoiding the use of a punty. for ease and speed. 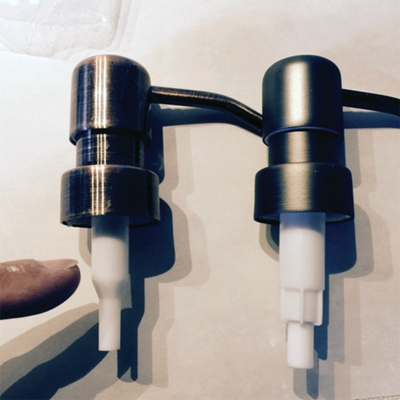 2cc soap pumps wont fit into this type of fitting, One Dream Design's 1cc soap pumps have a smaller shaft, so will fit perfectly! 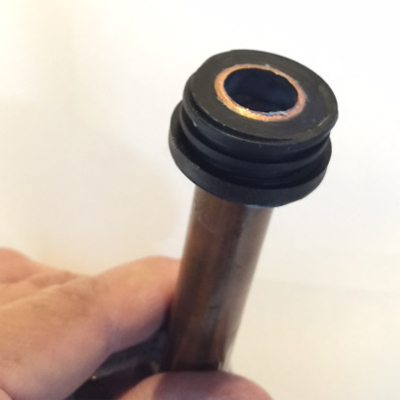 1cc verses 2cc soap pump shaft, the 1cc fits inside a half inch copper pipe, the 2cc requires a larger diameter 5/8 inch blow pipe. Either way the pump will slide in, the trouble might be if a customer picks it up by the pump instead of by the bottle, the pump will slide right off and drop on the floor! and it doesnt lock in fluid tight, there are two ways to fix both issues respectively. 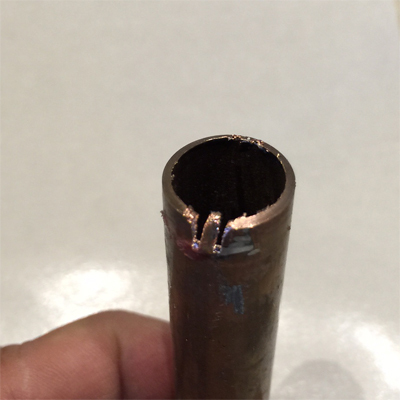 A glue down collar may be used for leakproof attachment to a 1/2 inch copper pipe, these are stocked in white, and black. Notch and bend in tab, either with snips or a hack saw, to grab soap pump shaft.